Can Playing Basketball Cause Back Pain? Foot, knee and ankle injuries tend to be common in basketball due to the nature of the game. However, landing flat on your back or going for the jump shot and landing hard on your feet can also result in lower back pain, a common complaint among both amateur and professional athletes, including basketball players. At The Spine Institute Center for Spinal Restoration, we take a conservative approach to spine surgery, meaning that surgical treatments will only be recommended after all other options have been exhausted. When it comes to basketball, most players will be able to recover from pain with rest and non-surgical treatments. The following outline some of the most common causes of back pain related to basketball so you can better understand where your pain might be stemming from. Back strain can refer to any type of injury to the soft tissues of the lumbar spine. 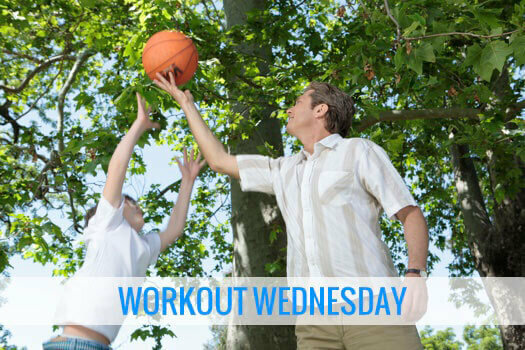 Twisting, jumping and falling can all be causes of back strain from playing any form of basketball, even if it’s just a quick game with the kids. The good news is that back strain usually goes away after some rest. Excessive stress on joints supporting the spine can result in damage to intervertebral discs, which are essentially your spine’s natural shock absorbers located between each vertebra. Over time, repeated injuries, even minor ones, can slowly wear away these discs, making the spine unable to fully absorb the added strain from repeated movements, often resulting in a herniated (bulging) disc. Note: A herniated disc sometimes results in sciatica, nerve damage characterized by numbness or pain in the back of the leg, calf or one side of the foot. Younger basketball players may experience back pain due to growth issues possibly related to athletic activity and overexertion of muscles supporting the back. Adolescent back pain is often caused by a curvature of the spine (scoliosis) or juvenile osteochondrosis of the spine (Scheuermann’s disease) characterized by pain that becomes evident with physical activity. While most athletes tend to want to “play through the pain,” reporting ongoing discomfort early increases the odds of finding a successful treatment. If you find that you are living with chronic back pain that may be the result of an injury incurred on the court, reach out to Dr. Hyun Bae and his team of spine specialists and schedule an in-person consultation. Call 310-828-7757 – we are here to help.